The computer game "Deer Avenger" made by Simon and Schuster is a humorous parody of the game "Deer Hunter." It was a bright sunny day...outside. Inside the high-rise walls of the massive Genron Corporation, however, it was quite a different story. In fact, it was a very cold, dark day. For you see, Genron is a high-tech lab where innocent animals are used to test human products. Deep inside Genron lies the dreaded "Genetic Recombinator," the final destination for animal test subjects who have outlived their usefulness. On this particular day, Spanx, a crazy, electro-shock tested weasel and Redmond, a know-it-all, makeup-tested rabbit, are chained together, thrown in a locked cage, and sent on their way to the Genetic Recombinator. The plan is to fuse them together into a new, rather freaky, half-rabbit/half weasel creature--a "Weasit" or perhaps a "Reasel." As their lives begin to quickly flash before their eyes, a miracle happened. Somehow, Spanx and Redmond escaped from their cage at the very possible last second. Now, this weasel-rabbit duo are on the loose, attempting to break out from Genron. There's one small problem however--they're chained together. As Spanx, you will use Redmond (much to his dismay), as your tool and weapon of mass destruction. Defend yourself by using Redmond in hilarious ways including the Flaming Fur Ball, Radioactive Rabbit, Hare Clog and more. Demolish everything in the company from computers and test equipment to soda machines, plants and treadmills. Break it all and you'll drive the evil corporation into bankruptcy. Knock out the cruel lab staff with loads of super-charged attack combos. Release other caged animals that are being used to test new people products such as the Self-Operating Table and "Hair-Go" Hair Removal Kit. Once free, they will help you fight. Battle a band of baddies including a crazy cafeteria lady, a dirty surgeon, crooked rent-a-cops, and of course, the demented company president. Use Redmond to chain whip attackers, to swing over hazards, or to helicopter to areas unreachable by foot. Destroy security cameras, sneak around laser sensors, and access areas too small for humans to avoid detection by the ruthless security crew. In your attempt to flee this gigantic building, you will encounter a genetic research lab, a toxic sewer system, fancy executive offices, and much more. Whiplash is a unique game where you'll control two characters at once -- two animals trying to escape maniacal doctors that test products on them! the two animals must work together to escape and fight the people after them, so managed their "chained" abilities wisely or they won't make it Free other caged animals by using your chains as a weapon, part of grappling hook and other funny and clever ways Fight off the bad guys trying to lock you up again -- from the vicious guard dogs to the crazy doctor with the giant syringe Destroy security cameras, sneak around laser sensors, and avoid ruthless security personnel to escape and taste freedom! You have to get this game! This game is really funny and fun to play! you play with a crazy weasel who uses a rabit as his weapon. its really fun and will keep you entertained for hours and hours. First of all, this is a completeley original game. Don't be fooled by it's dark and deranged outer shell, because Whiplash is a fun and inovative platforming/action game. The story goes like this. There is a evil, huge mega corporation that use animals to test new human products. It just so happens that Spanxs the weasel,( who was experimented on with electricity, ) and Redford the rabbit ( who was experimented on with beauty products, ) are chained together and are about to become fused together for the rest of thier lives. Yet they escape the grap of the scientists, and must elude capture at all costs, as well as free all of the other test animals. The only catch? They're chained together. It does sound wierd, but it is completley addictive and fun. You use Redford, who is indestructable because of a hairspray test that gave him an impeneterable shield, as a whip and can give him many funny and useful powerups. These include on that inflates, another that lets him electrify gaurds and other enimies, plus at least a dozen more. Or you can simply whip him about. The graphics, while not the best, are very unique and have a griddy/saturday morning cartoon look about them-not bad at all, and they stay at a very constant framerate. The sound is great, with a mix of bizzare sound effects and catchy music. The game is however not as long as it could have been, roughly about ten to fifteen hours depending on how good you are at it, but nevertheless, it is still well worth the forty dollars. I recommend Whiplash to everyone, so don't miss this clever and original game when it comes out the seventh! Reviewer: Damon Sindelar from Missoula, MT. Whiplash is a hilarious, fun, challenging game for the ages. The humor of the rabbit and weasel is enough to sending you to saying the game rocks. And the challenges is an adventurous journey. So Me and my siter both think this game is the best of all times!!!! Jak 2? Ratchet and Clank? Do they have a crazed weasel chained to an indestructible bunny bestowing havoc on an evil animal testing corporation? I think not, but Whiplash! certainly does. former captors. There is just something fun about beating people and the surroundings silly with a rabbit, that keeps it from ever getting old or repetitive. The graphics are well done, by keeping a cartoony feel to the game. The animations are also very nice, and the attack animations never cease to bring a smile to my face. The sound effects are top notch, as you can hear every footstep of the maniacal weasel exploring and destroy the facility. It even has a neat background musical score, complete with 'real' elevator music. While the visual and audio effects are not especially stunning, they do compliment the humor and fun of the game fantastically. What really makes this game great, is it is hilarious. The cinematics are at times hysterical. Many times I found myself extremely excited to trigger another cinematic, because I couldn't wait to find out what zany humor would come up next. Redmond's (the rabbit) wise cracks throughout the game are always entertaining, and they did a good job of not being too repetitive. The gameplay is excellent, mainly because breaking things with a weasel and a rabbit never gets old. It's also very cool using the rabbit in very interesting ways (there's a couple instances involving a toilet!) to solve puzzles and progress through the game. Basically the bunny is quite an amazing creature, that is constantly tormented by the psychotic weasel in their desperate attempt to escape. Overall, an excellent choice for purchase. There isn't another game out there like this one. So if you like to be entertained by slightly zany humor, and the idea of causing mayhem with two very unlikely heroes interests you, pick this game up. A computer game in which players as young as seven are asked to destroy an animal testing laboratory is to go on sale despite being criticised as "irresponsible" by police and MPs. 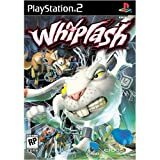 Whiplash, which is made by Eidos, the British software company that created the Lara Croft computer games, depicts animals being abused in a laboratory, including one experiment in which a hamster is fired from a cannon and another in which monkeys are forced to run on treadmills to test their endurance. Players are asked to free the animals by destroying security cameras, wrecking the laboratory and chain-whipping police officers. Eidos, which supplies stores including Toys R Us, HMV and Virgin Megastores, describes the game as featuring "a shackled animal duo on a mission to escape and sabotage an evil animal product-testing corporation". It says that the purpose is to raise "positive awareness" about animal testing among children. Ian Gibson, a Labour MP and the chairman of the House of Commons select committee on science and technology, said, however, that he feared that children would gain a distorted view of animal experimentation. "This is unhelpful to the whole debate. It is a nasty and vicious way of prejudicing young minds for the rest of their lives," said Dr Gibson. "Young people with fresh minds need to be brought into an understanding of the problem with both sides of the argument being put forward in a rational and reasonable way. Clearly such programmes are not bringing a balanced judgment to serious and difficult areas of understanding." Penny Hawkins, the deputy head of the RSPCA's research animals department, was also critical. She claimed that the game made light of animal suffering, which was offensive. "Animals suffer when they are used in research and it's extremely disappointing that someone would see fit to produce a so-called humorous computer game out of that suffering. "The RSPCA puts a lot of effort into encouraging children to be compassionate towards animals and empathise with them. This is obviously sending out completely the opposite message, that animal suffering is funny - that it is something to make a joke out of. "We believe that being violent is not the best way to help animals. What is not needed is a computer game trivialising their suffering." The release of Whiplash, which will go on sale at ?39.99 in Britain next week, will add to concerns about the spread of militant animal rights campaigners, such as the Animal Liberation Front and the Stop Huntingdon Animal Cruelty group. These concerns reached a peak recently when a campaign of harassment by animal rights activists caused Cambridge University to shelve plans for a ?32 million monkey research centre. In Whiplash, the game's action centres on two shackled animals - Spanx, an electric shock-tested weasel, and Redmond, a rabbit left deformed by testing with make-up. The animals have to escape from the laboratory despite being chained together. The game urges children to "demolish everything in the company from computers and test equipment to soda machines, plants and treadmills. Break it all and you'll drive the evil corporation into bankruptcy". In a statement, Eidos said it hoped that the game would highlight the issue of animal experimentation among children. "Whiplash is based in a fictional animal-testing laboratory where the object is to rescue all of the animals and destroy the evil testing lab. Although the video game is fictional we hope that it raises positive awareness of animal testing among children." Mark Matfield, the executive director of the Research Defence Society, which supports ethical and humane animal experimentation, insisted, however, that the scenes portrayed in the game, including animals chained together, were totally inaccurate. "The suggestion that this game might raise young people's awareness of the issues involved in animal experimentation is ludicrous," he said. "It's worrying that this game appears to condone acts that are clearly illegal or violent as an appropriate way of contributing to an informed debate." Jan Berry, the chairman of the Police Federation, which represents rank-and-file officers, added: "This game is both alarming and disturbing. "The role of the police service is to be independent, uphold the law and prevent disorder. We already have a tough enough job and this game seems to be sending the wrong message to young people, which is totally irresponsible." Eidos, which has its head office in Wimbledon, is one of the world's leading publishers of entertainment software. The company employs 500 people worldwide and posted a ?17.4 million pre-tax profit in the year to June. Whiplash was developed by Crystal Dynamics, a Californian company also responsible for Eidos's Tomb Raider computer game series.